When resident Northampton couple Mr and Mrs Rutledge contacted our team some few weeks ago, it was immediately clear the job that needed to be completed, and the apparent danger that was present. Upon arriving at the Rutledge’s home, we were quite amazed to see a white dilapidated conservatory whose roof was in danger of collapsing any minute. Our expert team instantly realised what needed to be done, renovating the white roof and frames for high quality replacements. The couple had heard of our previous work performed in the area, having researched it on our website beforehand. This gave Mr and Mrs Rutledge the confidence needed to contact our knowledgeable team of installers who were more than up to the task. Mr and Mrs Rutledge’s home is very rustic in style and as such, we thought it best to install the new white window frames required coloured in a charming wood-grain effect on the inside that would perfectly compliment the home’s existing visual aesthetic. Externally, we matched the windows to the “Farrow & Ball” painted windows of the main house – never before has the conservatory felt more natural! Not only can the Northampton couple enjoy increased charming period features and enhanced aesthetics, but they will also be able to benefit knowing that the newly installed double glazing will better retain heat in the space – instantly making it more usable. Not only will this improve comfort, but will also have the potential to save Mr and Mrs Rutledge a penny on their energy bills! Here to help for any homeowner in need! 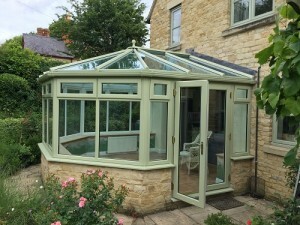 Needless to say, Mr and Mrs Rutledge were left very impressed with the endless result, now able to make use of their enhanced conservatory space safely and with confidence 365 days a year rather than just the summer period. If you’re concerned that your extension may no longer be safe or simply want to breathe new life into your home, get in touch online today!